In a Feb. 2011 press conference, General Mohammed Ali Jafari, the commander of the Iranian Revolutionary Guard Corps (IRGC), unveiled a new, locally developed missile. In reference to the missile, he stated that “as the enemy‟s threats will likely come from the sea, air,and by missiles, the Revolutionary Guard has been equipped with capabilities to neutralize the enemy‟s advanced technology.”. They provide valuable insight regarding Iran‟s disposition toward the US military presence in the region, its responses to that presence, and ultimately how it intends to confront the US strategically. As a key element of Iran‟s strategic deterrent and doctrine of asymmetric warfare, Iran‟s advancements in ballistic missile technology cannot be ignored. 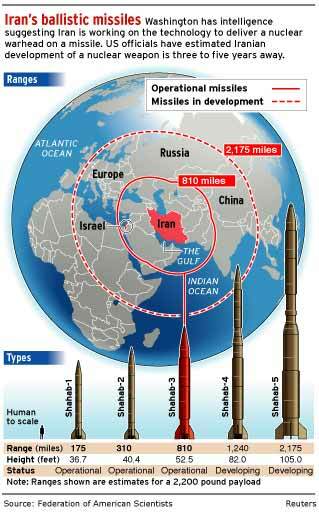 Tehran views ballistic missiles as critical to its national defense. In addition to an effective means for delivering a nuclear warhead, Iran‟s military establishment firmly believes that an effective ballistic missile program provides the country with increased strategic and asymmetric capabilities. Since the early 1980s, Iran has been developing a burgeoning ballistic missile capability based on Russian, North Korean, and Chinese technology. Iran currently possesses the largest ballistic missile inventory in the Middle East, and the country‟s military and scientific establishments are working to increase the sophistication, scale, and reach of its missiles. Tehran sees its missile capabilities as a key element to deter attack as well as a means to strike at high-value targets with little warning, such as Western and Western-backed forces in the region, including US bases in the Persian Gulf. Of particular note are Iran‟s medium-range ballistic missiles (MRBMs), which include the Shahab-3 and its longer range variants. Based on the North Korean Nodong-1, the Shahab-3 has a range of 1,000 to1,500km, and can potentially reach targets throughout the Middle East. Other Iranian MRBMs include variants of the Shahab-3, such as the Shahab-3A, Shahab-3B, Shahab-4 (Ghadr-1), Sejjil, and the BM-25. These missiles have ranges of 1,500 to 2,500km, and are thought to be able to strike at targets throughout the Middle East, Turkey, and southeast Europe. In response to Iran‟s continuing development of MRBMs and research into intercontinental ballistic missiles (ICBMs), the US Navy has stationed Aegis anti-ballistic missile cruisers in the Persian Gulf. Additionally, Bahrain, Egypt, Israel, Jordan, Kuwait, and Saudi Arabia have acquired the MIM-104 Patriot surface-to-air missile system from the US, which is capable of intercepting and destroying incoming ballistic missiles. The Iranian leadership is not shy about its country‟s advancements concerning ballistic missile technology. High-ranking officials in Iran‟s political and military establishments regularly boast of their country‟s progress in this field. On Feb. 8, 2011, the Tehran Times reported on IRGC chief Mohammed Ali Jafari‟s claims at a press conference that Iran had developed “supersonic” smart ballistic missiles which “cannot be tracked and can hit targets with high precision” as well as “coastal radars with a range of 300km.”, General Jafari also stated at the conference that the IRGC had recently completed studies on two mobile radars with a range of 60km, which could be attached to small destroyers. As the commander of the IRGC, statements made by Mohammed Ali Jafari are not to be taken lightly. While General Jafari‟s statements do not mention the US directly, his mention of an enemy with “advanced technology” threatening Iran from the sea and air most likely alludes to US air and naval power. This statement and others like it reflect Iran‟s strategic priority of denying foreign access to its waters, and what Iran perceives as the best measures for countering the US presence in the Persian Gulf region. Other senior officials in Iran‟s government have recently highlighted the importance of ballistic missile development. At an IRGC ceremony on Sept. 21, 2010, Iran‟s Minister of Defense, Ahmad Vahidi, stated that “the operational capabilities of the missile unit of the IRGC Aerospace Force will be remarkably enhanced” by the third generation of the domestically designed and produced Fateh-110 missile. These remarks made by such a high-ranking figure are revealing; they are a direct indication of the Iranian regime‟s continued willingness to improve its asymmetric capabilities against the US and step up its deterrent to attack. Since Oct. 2010, it is believed that Iran has used satellite launches as a means of conducting further research into its ballistic missile program. While the Iranian government has not stated that these launches serve to further its missile program, there is good reason believe that they are intended to broaden Iran‟s technical expertise regarding ballistic missile technology. In early Feb. 2011, Iranian President Mahmoud Ahmadinejad stated that Iran would fire a number of new satellites into orbit over a 12 month period starting in March 2011. Additionally, on Jan. 31, 2011, Iran‟s government announced that it would soon unveil two new satellite-launch rockets: the Safir 1-B, which is capable of placing a 110 lb. satellite in 185-280-mile orbit, and the Kavoshgar-4 rocket, which has a range of roughly 75 miles. Although for the stated purpose of launching satellites, the technology used to do so is equally applicable to the research and development of ballistic missile technology. In light of these developments, it is clear that the Islamic Republic will continue to develop its ballistic missile capabilities as a way to counter perceived American aggression. Given the growing sophistication, range, and scale of Iranian missiles, the country‟s research and development into this technology will continue to shape the balance of forces and power in the Middle East for the foreseeable future. The above statements made by key individuals within the Iranian regime since September 2010 are revealing. Regardless of their bias or validity, they reflect the continued hostility of the regime toward the US presence in the region as well as its desire to render the Persian Gulf inaccessible to US forces and influence. As long as the Islamic Republic sees its regional interests encroached upon or threatened by larger, more technologically advanced forces, it will almost certainly continue to develop its missile capabilities to compensate for its conventional shortcomings. 800-mile range. The Defense Department report of April 2010, cited earlier, has the missiles as “deployed.” Still, several of its tests (July 1998, July 2000, and September 2000) reportedly were unsuccessful or partially successful, and U.S. experts say the missile is not completely reliable. Iran tested several of the missiles on September 28, 2009, in advance of the October 1 meeting with the P5+1. 1,200-1,500-mile range. The April 2010 Defense Department report has the liquid fueled Shahab-3 “variant” as “possibly deployed.” The solid fuel version, called the Sajjil, is considered “not” deployed by the Defense Department. The Sajjil is alternatively called the “Ashoura.” These missiles potentially put large portions of the Near East and Southeastern Europe in range, including U.S. bases in Turkey. July 6, 2006 story, which asserted that the North Korean-supplied missile is based on a Soviet-era “SS-N-6” missile. Press accounts in December 2010 indicate that Iran may have received components but not the entire BM-25 missile from North Korea. ICBM U.S. officials believe Iran might be capable of developing an intercontinental ballistic missile(3000 mile range) by 2015, a time frame reiterated by the April 2010 DOD report. On September 6, 2002, Iran said it successfully tested a 200 mile range “Fateh-110” missile (solid propellant), and Iran said in late September 2002 that it had begun production.Iran also possesses a few hundred short-range ballistic missiles, including the Shahab-1 (Scud-B), the Shahab-2 (Scud-C), and the Tondar-69 (CSS-8). In January 2009, Iran claimed to have tested a new air-to-air missile. On March 7, 2010, Iran claimed it was now producing short-range cruise missiles that it claimed are highly accurate and can destroy heavy targets. A Wall Street Journal report of September 14, 2005, said that U.S. intelligence believes Iran is working to adapt the Shahab-3 to deliver a nuclear warhead. Subsequent press reports say that U.S. intelligence captured an Iranian computer in mid-2004 showing plans to construct a nuclear warhead for the Shahab. The IAEA is seeking additional information from Iran. Iran has already demonstrated a three stage operation with the solid propellant Ghadr-110/Ashura program 2,000 km range designed is now being produced for deployment which has finally been publicly acknowledged after completing development to replace the liquid propellant Shahab-3B, 3C/Ghadr-1 already deployed. The Shahab-3B, 3C/Ghadr-1 design has a 2,000 km range performance. 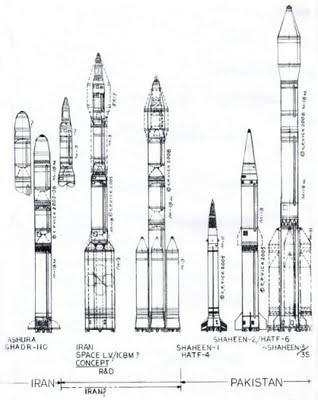 How advanced the Iranian Ghadr-110/Ashura as compared to the Pakistani Shaheen-2 can be questioned in the sense it utilized the three stage concept in flown flight test configuration verses the near identical two stage Shaheen-2 design approach that Pakistan used. 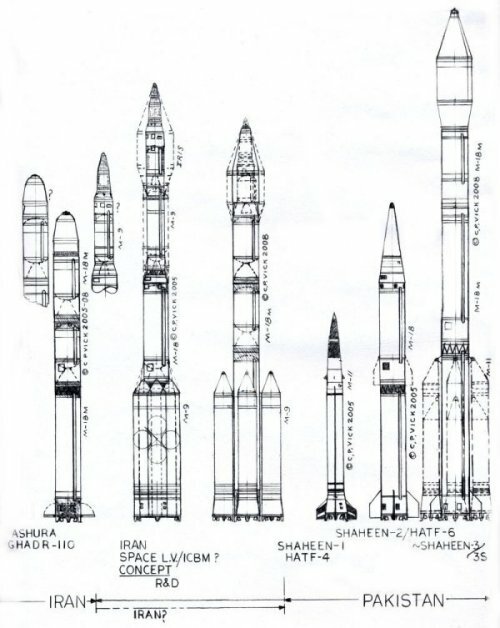 It would appear that Iran chose to choose to use two identical half length solid motors of identical diameter for a second and third stage instead of the Shaheen-2 like first stage one with a sea level nozzle and the second one with an altitude nozzle as the second stage. These separate but similar design approached do portent of future developments in longer range ballistic missiles as well as space boosters. Iran may be considering the on going rapidly developing solid propellant program as the basis of a satellite booster in a similar manner as being studied by Pakistan. It would appear that Pakistan in fact plans to lengthen the Shaheen-2 first and second stage solid motors to obtain higher performance for its space booster while retaining the existing M-11 based Shaheen-1 solid motors strap–on boosters. In any case both developments could and would lead to potential IRBM/ICBM development masquerading as space boosters for both countries. The Iranian suggested fiscal planning pacing would seem to suggest that the rapidly developing solid propellant program is taking precedent over the very advanced liquid propellant missile programs for obvious military purposes but that has yet to be proven. What kind of design mix Iran will ultimately develop for it heavier capacity satellite launch vehicle remains uncertain. Iran for the moment seems to have by passed the development of the Ghadr-101 solid propellant ballistic missile program based on the Chinese M-9 technology. However this program would be expected to manifest itself with the advent of a solid propellant space booster presumed to be in development now. Whether these solid propellant ballistic missile developments whose origins can be traced from South Africa to China to Pakistan and finally Iran will reappear in North Korea is the larger unanswered exceptionally serious issue at hand. IE if Iran has it North Korea has it or vice versa. 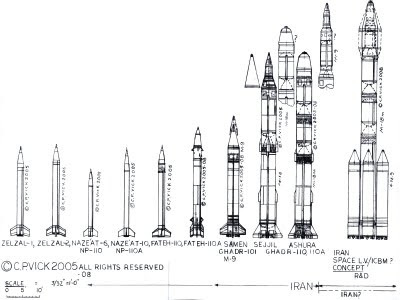 What is this Ghadr-110/Ashura Warhead Design? When studying the launch image of the Iranian Ghadr-110/Ashura it appeared that the front end is designed to a very different warhead strongly resembling that of an encapsulated MRV design. This has been suggested in various Iranian discussions but it could also be an entirely new nuclear warhead re-entry vehicle design developed to accommodate the Atomic device designs known to have been studied by Iran. However considering its strategic deterrent value as a MRV in the face of Israeli and American strategic defense systems design performance in fact nullifies its strategic value as a MRV weapons system unless it is a single warhead. At this juncture it remains one of the unknowns from the available open source information coming out of Iran in spite of the known design studies by Iran. 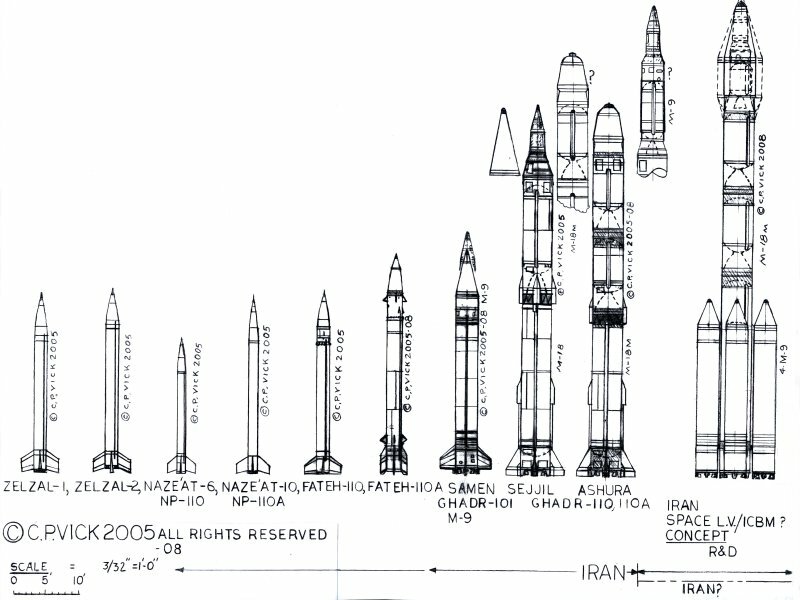 Most of the solid propellant combinations used by Iran’s solid fueled ballistic missiles and space boosters are believed to be batch produced primarily in an isolated facility south west of Esfahan and south of Najafabad adjacent to the place named Madiseh. The vast expanse solid propellant explosives plant is believed to be located directly across from Madiseh south west of Esfahan. This vast isolated facility has all the industrial temporary storage revetment temporary, test and long term storage production facilities to cast and store these solid motors for Iran’s solid propellant ballistic missiles and potential future space boosters. It also is believed to house the required final assembly industrial facilities for those missile systems. What is it with These Names Shahab-3 A, B, C, Ghadr, Ghadr-110, Ashura, & Kavoshgar? 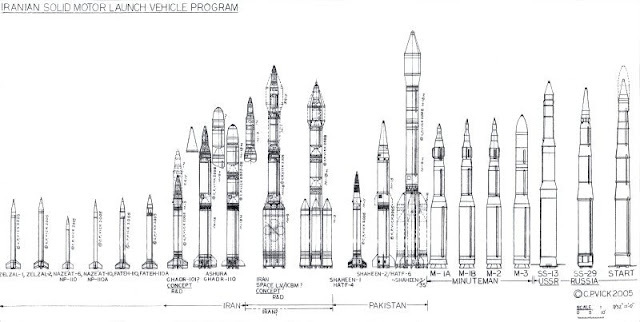 The Shahab-3, 3A are variants on the basic No-dong-A design while the Shahab-3B is a lengthened improvement on the Shahab-3A. The Ghadr-110 is the Ashura solid propellant replacement for the liquid propellant Shahab-3A, 3B series. The Ghadr-110 is the original name applied to the Iranian government renamed Ashura. The Kavoshgar is the Iranian Shahab-3C Ghadr missile system a lengthened Shahab-3B used as a sounding rocket vertical probe. All of this would suggest that the Iranians are playing “name games deception” because two systems they are not showing the really important Ghadr-101/110 and No-dong-B missiles are the critical strategic systems. Basically with the Shahab-3B had been displayed in parade some three times before a variant on it the “Ghadr” Shahab-3C was displayed in parade suggest that the Iranians were both playing games to make news and play the psychological warfare game of “Names games deception”. One could also wonder about the political agenda games from which one can only guess. The missiles displayed are essentially variants of the Shahab-3B. There remains considerable uncertainty on Iranian development of the Taep’o-dong-2C/3 and its No-dong-B based development because of the problems associated with North Korea’s flight test effort. This is why the rapidly developing solid propellant program and its clear military advantages is more attractive to the military in addition to the faster pace of development that it offers for national goals as laid out in the series of three fiscal “three Year Plans”. This is only true to the extent the Google Earth images seem to indicate a North Korean/Chinese like launch facility in construction southeast of Semnan on the satellite launch infrastructure that supports a large liquid propellant space booster and not a large solid propellant booster. Only time will reveal the answer this issue. Are The Aircraft Carriers Obsolete? Has The Israeli President Blinked First? Sudeep Mukherjee. Powered by Blogger.